We'd like to thank those of you who made it to Pack Expo and stopped by the Schneider Electric booth. We had a great opportunity to meet many of you and learn more about the new projects being developed for packaging automation solutions. While we are the show promoting InTouch Machine Edition and the new IoTView, we also had a chance to get some insight into what to expect in coming years for packaging automation. One thing that became abundantly clear throughout the show was the fact that devices and machines are being connected in ways they never have before. Whether you call this a new dimension of remote monitoring, (Industrial) Internet of Things, or Industry 4.0, the end result is the same: better access to information, anywhere. While there is a difference in approach depending on whether you are an End User, Vertical OEM, or Horizontal OEM, we were pleased to find that there are great solutions on the market for any Internet of Things architecture. It is possible to scale up from InTouch Machine Edition IoTView in a single device, up to System Platform for centralized data. The InTouch Machine Edition demo that drew the most attention was the demonstration on a Raspberry Pi device. As engineers start experimenting with devices like Raspberry Pi, Arduino, Beagle Bone, and others, the interest in non-traditional, low-cost hardware populating the plant floor will continue to grow. InTouch Machine Edition IoTView offers a core runtime for Linux and VxWorks, making it possible to connect very low-end devices. The need to expand data collection/data visualization down to the machine level is placing increasing cost pressures on engineering departments. To many, SCADA used to mean a large-scale monetary investment, but it offered a centralized top level platform. Some of the technologies that have been popular in the past don’t transition well to a distributed environment when the requirement is machine level information and presentation (both from a SW cost, and from a hardware cost associated with resources to run some “heavy” applications). Now, with engineers looking for lightweight, cost-effective solutions that can be deployed in many places cost effectively, software such as IoTView offers a solution that makes financial sense for these kinds of deployments. This interest in devices that do not run the typical Windows platform has posed a challenge for connecting devices running on operating systems other than Microsoft. While web thin clients have allowed connectivity through web browsers for some time, there is still a great deal of demand for platform agnostic software with a single development environment for multiple platforms. InTouch Machine Edition has made this much more streamlined with IoTView. Now applications can be developed in one single environment and then be deployed to different devices without having to use different software for each different platform. Adoption rates of the PackML standard have been varied within the packaging industry, though it has begun to grow in other industries. One aspect of the slowed adoption rate is that OEMs have been slow to invest in integrating PackML compliant HMIs in their machinery or automation components. This is expected to change as more HMI software solutions begin offering ready made PackML solutions that can rapidly speed-up the development time of such applications. 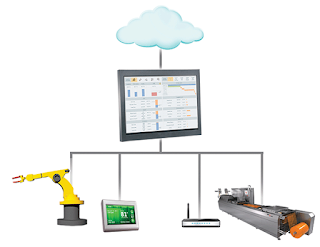 Remote monitoring capabilities continue to be very important to the packaging industry. As the Industrial Internet of Things increases in adoption, it's much easier to react to machine-level changes with the aid of devices such as tablets, smartphones, and smart watches. Customers are demanding remote monitoring capabilities, and InTouch Machine Edition has kept ahead of the curve by offering solutions that make it easy to develop applications that can be deployed to any device and offer information and access on a machine or plant level.